The Prodigal, dressed in a plain smock, sits on a low wall. Holding a staff in his left hand, he extends his right palm to the farmer, pleading for work. The well-dressed farmer stands before the Prodigal with his arms extended in a gesture of welcome. In the background is a scene of rural buildings and woods executed in fine detail. Popham makes the attribution ‘after Pieter Coecke?’ for this and SG125, The Prodigal Departs. Berserik also attributes these panels to the workshop of Pieter Coecke van Aelst at Antwerp. Although the poses seem characteristic of Coecke’s rather mannered style they also serve to emphasise the desperate pleading of the Prodigal. The yellow stain is used quite freely, in contrast to the previous, but earlier panel, SG26. 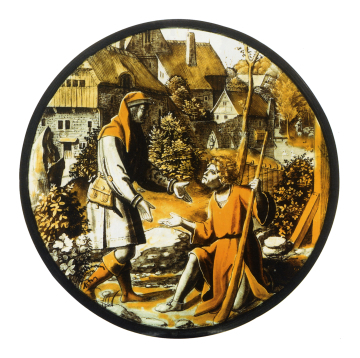 The parable of the Prodigal Son was a popular subject both for series of prints and for glass paintings based on them. The example here has evidently been taken from one such series, of which other related scenes can be seen in the versions of The Departure of the Prodigal at Fawsley, St Mary (Northamptonshire) and at Locksley Hall (North Somercotes, Lincs.) and the probably related Prodigal Receiving his Patrimony at the Victoria and Albert Museum, London, at St Mary the Virgin, Addington (Bucks.) and also at the Fondation Custodia, Paris. Others possibly deriving from the same series are The Prodigal Feasting, The Cloisters, New York and the Victoria and Albert Museum, London, and Return of the Prodigal, Musée d’Art ancien, Brussels and Fondation Custodia, Paris.